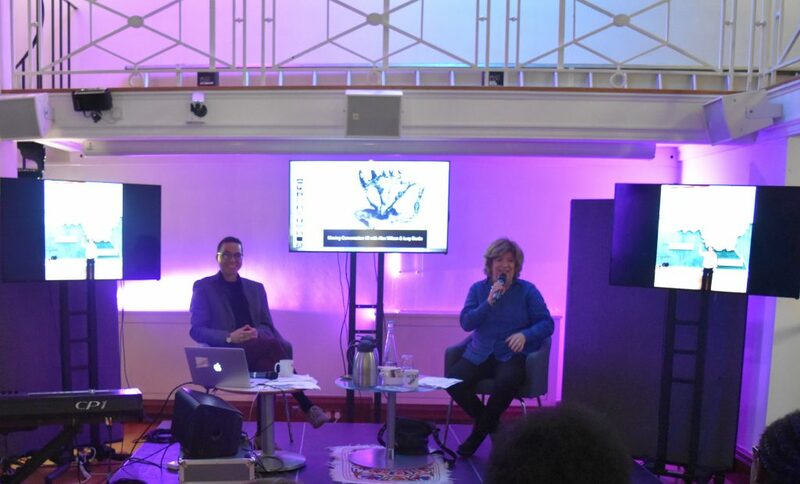 On the 2nd March 2017, Modern Moves presented a very special Moving Conversation centered on musical and choreographic transatlantic dialogues featuring renowned Latin Jazz pianist Alex Wilson and ethnomusicologist and music producer Lucy Durán of School of Oriental and African Studies. 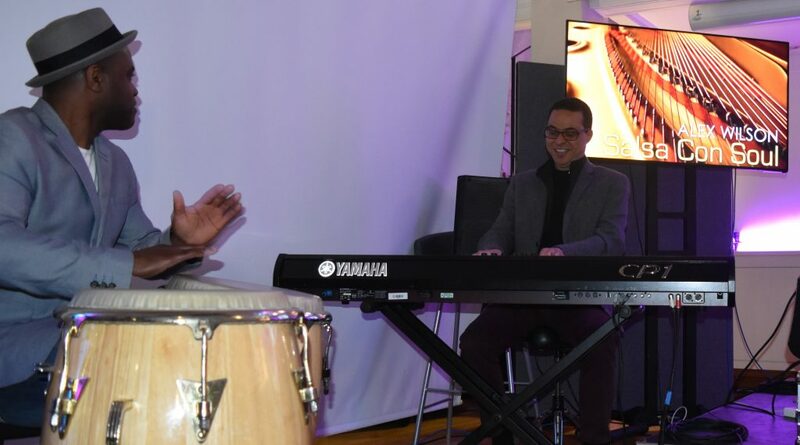 To the call of a rhythm from the Pacific coast of Colombia played by percussionist Emeris Solis on the congas, two dancers entered the venue and made their way to the front stage, while Alex Wilson joined on the piano. 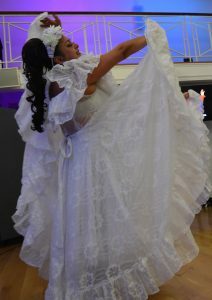 Swirling her large and flamboyant skirt, Xihomara and her partner performed a cumbia, a traditional Colombian dance. Leaving the room in the froufrou of their costumes, this excerpt gave a taster of the dance show that would follow afterwards. With some introductory words to the audience, Ananya Kabir presented the guests of our 8th Moving Conversation: pianist Alex Wilson based in Zürich and ethnomusicologist Lucy Duran from SOAS. 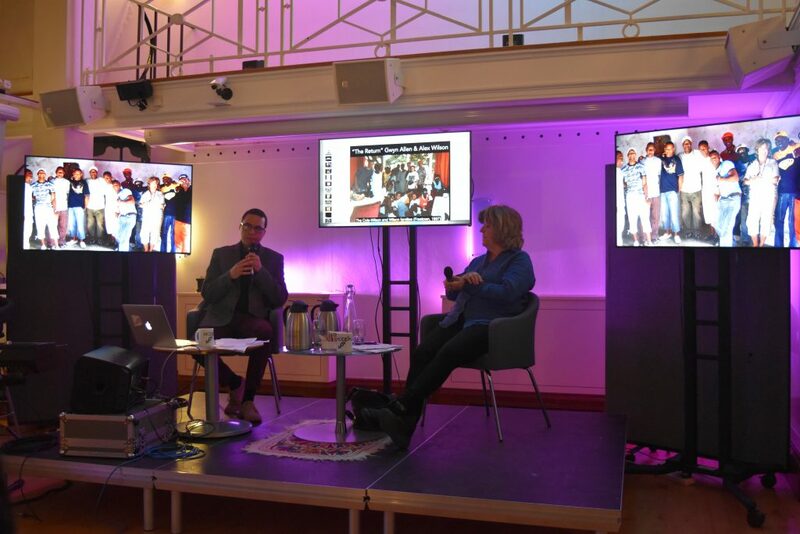 The latter started by recalling the audience that she studied music at King’s College London and also that the talk to follow would be more like an on-going conversation. Indeed our two guests know each other for a long time, they even worked together in at least two projects. She reminded how Alex’s fluency in Cuban and Latin American music struck her when she first met him. How did he get exposed to this music she asked him then, therefore inviting Alex to tell the audience a bit about his family’s history and how everything started with music in general. Alex explained that he spent his first year in Freetown, Sierra Leone, then got back to the UK for 9 years before moving to Vienna for about 6 years and then relocated to Geneva. Calling on his memory, he made us listen to an excerpt of ‘Ngombu’ by Sierra Leonese band Super Combo King’s. He presented it as the kind of music he would hear as a child when his house was set up to welcome a party. He also described that his father used to play the piano at home, therefore exposing him to this instrument since his very childhood. Alongside his familiarity with the piano, Alex also played the classical guitar and actually increased this practice for about 6 years at the Vienna’s conservatoire before relocating in Geneva. He explained that his willingness to go more towards jazz as well as the possibility of playing in a band made him decide to switch instrument in order to make this “jump” possible. Later on, he came back to the UK to study electronic and computer engineering at York University. Thanks to an exchange place at the University of California Santa Barbara, he realised a key encounter with salsa music, mainly Puerto Rican salsa dura that he described “pouring out houses”. One of Alex’s entry point to get into the Latin music scene was Poncho Sanchez, a Mexican musician based in Los Angeles who used to revoice jazz standards into latinised versions. Alex used to transcribe his recordings for his student band. When he graduated in 1993, he relocated to London and chose to become a professional musician. One of his entry point into the London music scene happened thanks to his ability to transcribe and write music. Orchestration and arrangement became as much part of his musical professional career as playing the piano noticed Lucy. She also recalled how in the 1990s UK the Latin music scene was quite at its beginning. It was therefore not that easy to listen to Latin live music in the UK at that time. Alex gradually got more and more gigs and soon started to perform internationally and travel the world. In 1997 he went to Sierra Leone where his paternal grandfather was from. Interrogating the sense of self-identity when one has a mixed familial background as well as multiple origins and living locations, the guests debated about such heated issues that are at stake in our globalised world. Acknowledging this trip to some of his family’s roots, he wrote a song called “The Return” with Sierra Leonese artist Gwyn Allen. The song refers to the returnees, that is the second generation Sierra Leonese who settled back in the country. As Alex said, it “has so many meanings on many levels”. At the beginning of the 2000s, Alex signed a 3-album recordings contract with famous music label Candid Records. After his first album Anglo Cubano, he was sent off to Cuba to record his second album, Afro-Saxon, released in 2001. For his third album entitled R&B Latino he continued his creative exploration of Latin music by mixing Cuban music with R’n’B, something he presented with humour as an encounter between Destiny’s Child and Buena Vista Social Club. Our guests then spoke about the first project on which they collaborated in 2008-2009. This project featured Malian and Indian singers. That is through this project that Alex encountered for the first time kora music from Mali, which he said “blew him away”. Drawing on this project, he played live for us the song “Remerciez les travailleurs” on the piano, showing how he managed to “invoke the feeling of the kora on the piano”. Paving the way for his next project Mali Latino released in 2010, Alex went to Mali several times to prepare the recording in the UK. Along Cuban and African music, Alex also mentioned that there are two other musical traditions that greatly influence him. One is the Jamaïcan nyabinghi drumming tradition, the music of the maroons, which for instance infused the music of Jamaican jazz pianist Monty Alexander. The other is the music of Pacific Coast of Columbia which he was introduced to by Emeris Solis. As an illustration of this influence in Alex’ work, he played with Emeris on the congas Currulao Cool, a song that features on Alex’ album Aventuras released in 2005. Going towards the end of the conversation, Lucy invited Alex to talk a bit about his current projects: one with British-Malawi singer Malia, another with salsa soul singer Nolita Golding that pertains as he said to his “contemporary salsa side”. 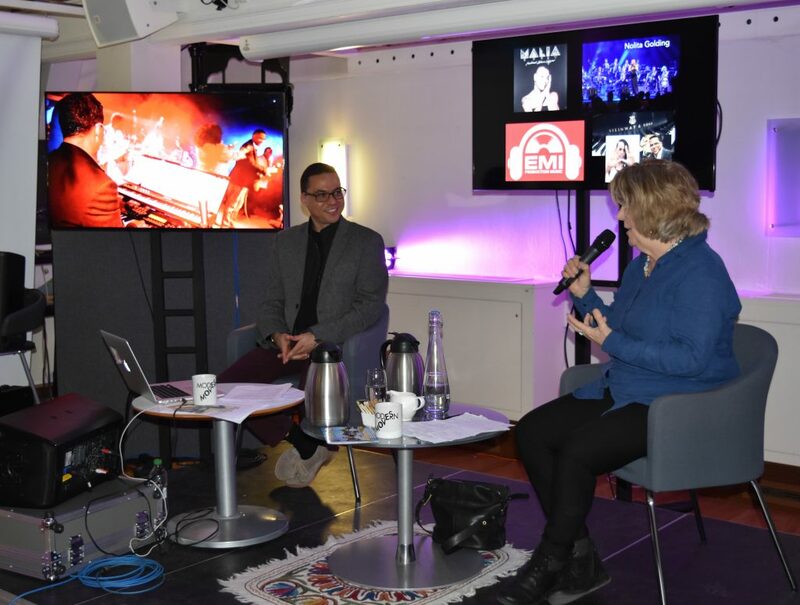 He also mentioned his production of music for television and his forthcoming concert at the Steinway festival with pianist Eliane Correa in London. 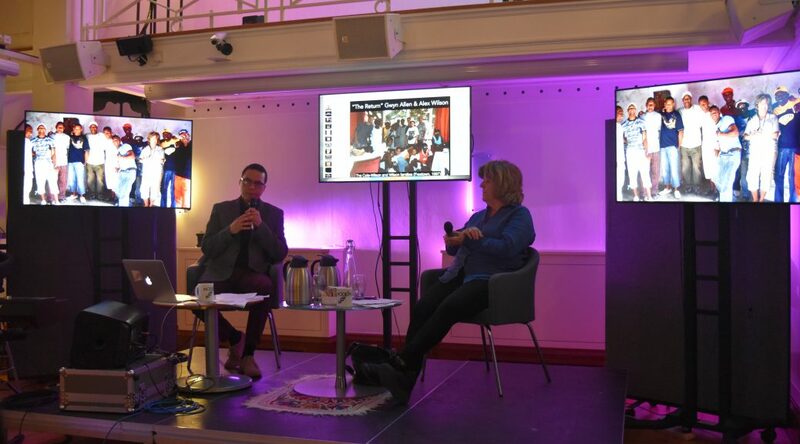 The conversation ended after a few questions and comments from the audience, mainly evoking memories of the local scene with venues such as the Bass Clef or the Jazz Bistrot that have now disappeared but had played a great role in the development of Latin and salsa music in the UK in the 1990s. Lucy had the last word by encouraging Alex to continue his work and produce more albums. Enriched by many audio-visual illustrations as well as live music playing, our guests enacted very generously the spirit of the Moving Conversation series. 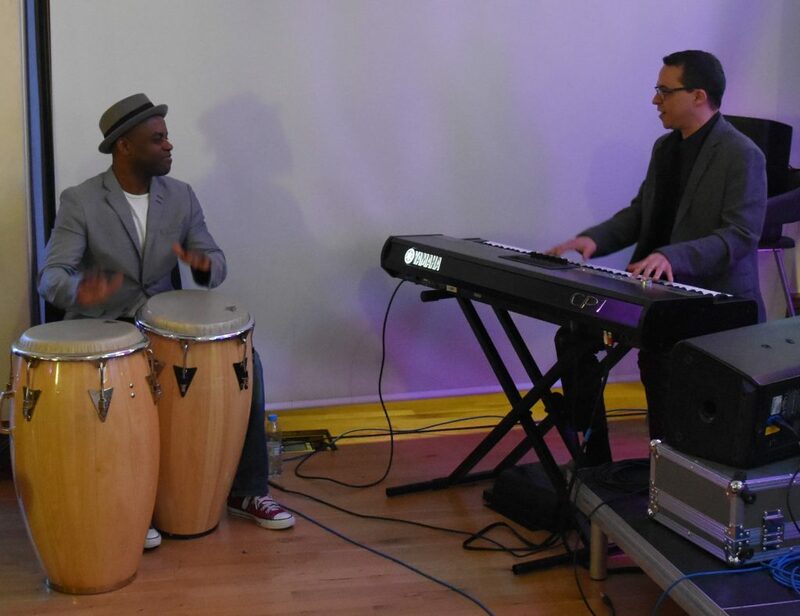 While the venue was set up to welcome the other part of the event, old friends reunited and the crowd joyously mingled around mojitos and our Afro-Cuban canapés to the first DJ set offered by John Armstrong. 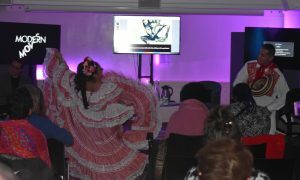 Then, taking a cue from our guests’ interest in Afro-descendant music and dance from Latin America, Yurupari Grupo Folklorico entered the stage. 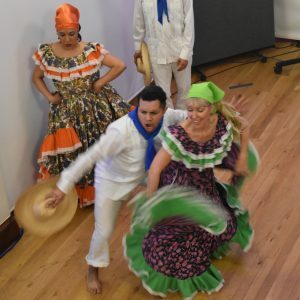 Under the direction of Xihomara Zentner, the dancers presented a curated dance showcase of Afro-Colombian dances from both Pacific and Atlantic Coasts (details of the repertoire below). 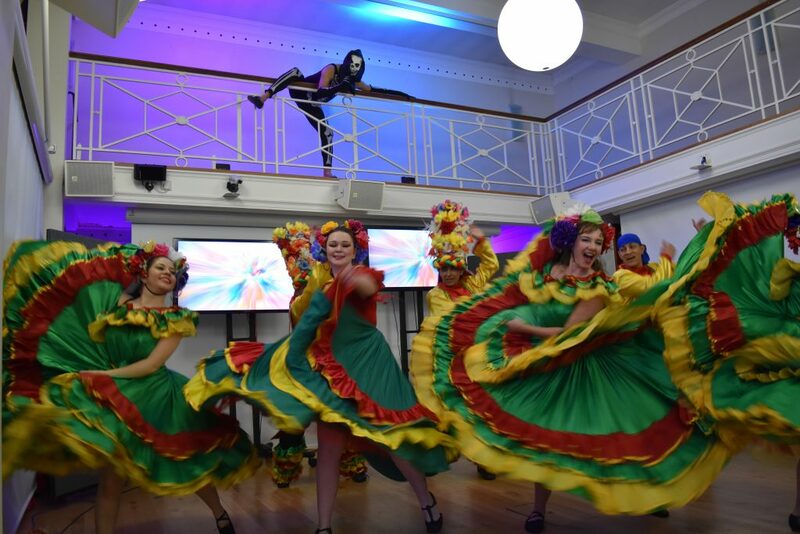 From the energetic Contradanza and Jota couple dances to the majestic and emotional Bullenrengue via Abozao and La Mina, the show ended with a cheerful and colourful Danza del Carnaval in homage to famous Baranquilla’s carnival. 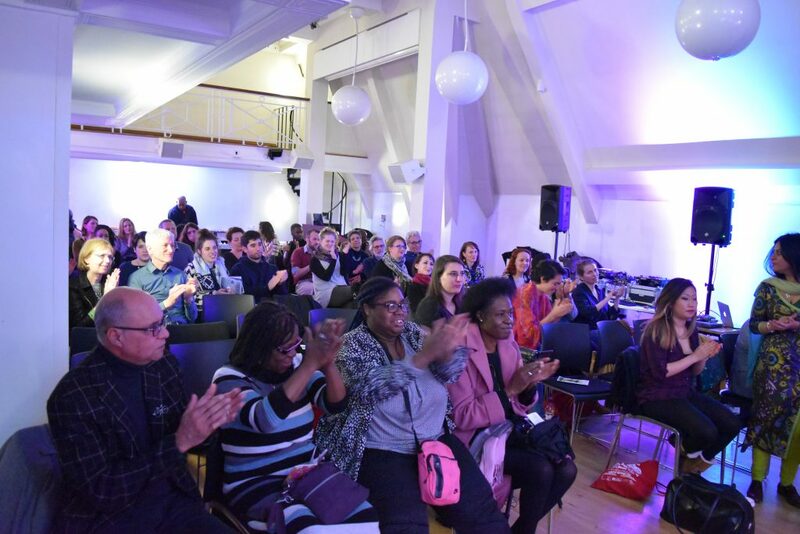 After some group photos and another DJ set by John Armstrong, the penultimate Moving Conversation of the year went finally to its end, fulfilling our minds and bodies with food for thoughts, new dance moves and precious memories. Cumbia is the most popular, celebrated and representative rhythm of Colombia. It has its origin in the slavery period of the 17th century. Despite its strong African ancestry, cumbia is also influenced by the native indigenous people, as shown by some of the instruments that are played, especially the flauta de millo and the traditional Colombian gaitas. Performed with the exceptional participation of Alex Wilson and Emeris Solis. Contradanza and Jota: These two dances are said to be the slaves’ version of their masters’ European dances. Performed in groups, the choreography shifts from group circles to couple motions, it can be said, often mocking the European movements. Abozao is said to be connected to a womb ritual dance from Africa, because of the importance and emphasis of the hip motions of the dance. This hip pattern is seen in other dances in Colombia and also in Ecuador and Peru within the African communities. La Mina (Mapale) is an original idea of professor Jacinto Jaramillo, a precursor of Colombian folklore in the 1930s. 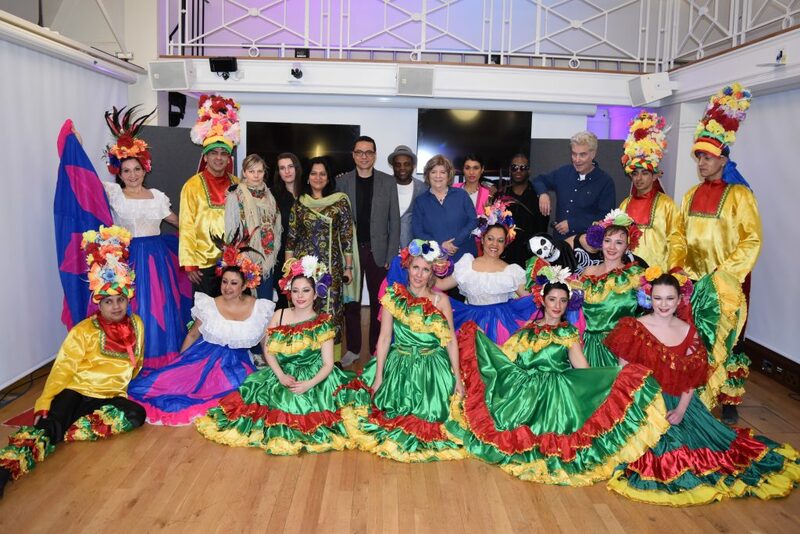 Danced to the rhythms of Joricamba and Mapale, both from the Caribbean coastal region of Colombia, with a song by Toto la Momposina. It tells the story of a slave rebellion and their fight for freedom. Bullerengue is a ritual dance performed exclusively by women, sometimes for the initiation of young girls to puberty or to show their fertility, and also for the loss of a child. La Danza del Carnaval: Barranquilla’s Carnival is the second largest in South America. This dance is typical of these festivities with all the popular songs and movements. 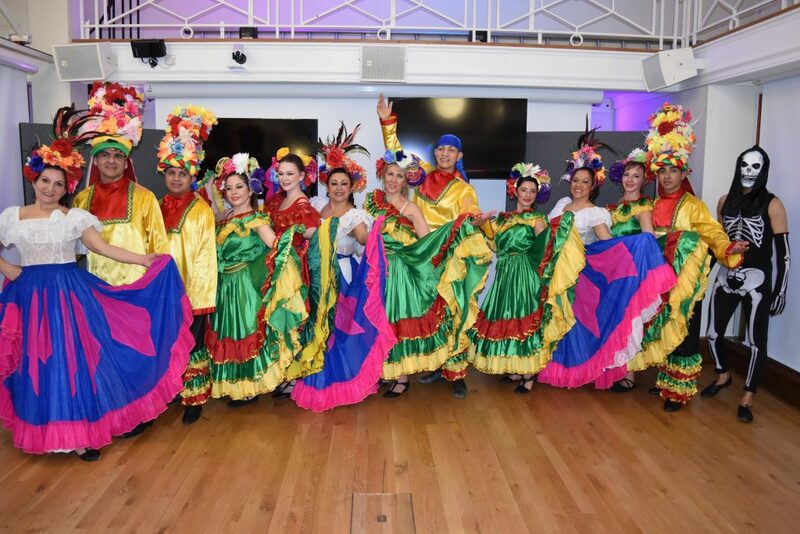 Dancers : Xihomara Zentner, Gloria Mendoza, Carolina Quintero, Yamileth Estrada, Nubia Merchan, Valentina Ross, Sam McCormick, John Fredy Peralta, Martin Montero, Jeray Montero, John Jairo, Hugo Tabares. Photos by Camilo Soler, text by Elina Djebbari.